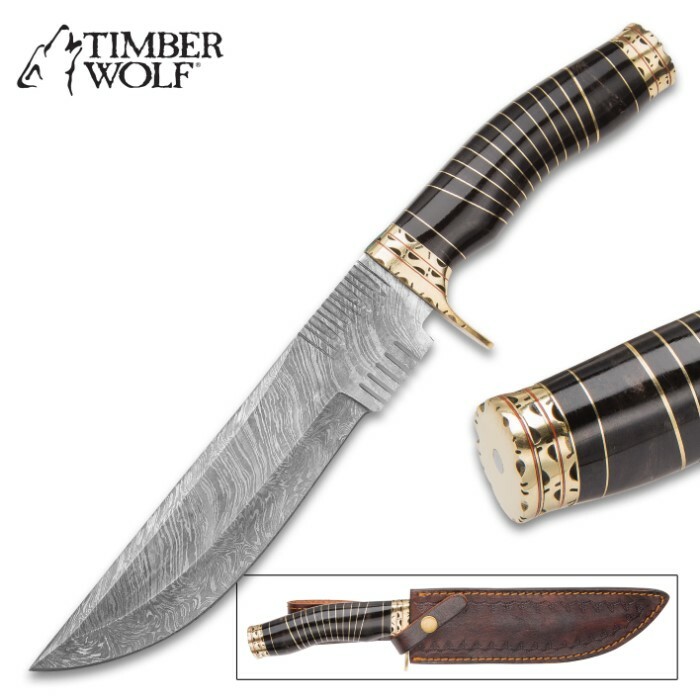 Timber Wolf Crucible Handmade Bowie / Fixed Blade Knife - Hand Forged Damascus Steel, File Worked Accents - Genuine Buffalo Horn - Scalloped, Grooved Brass - Leather Belt Sheath - Unique, Rare - 13" | BUDK.com - Knives & Swords At The Lowest Prices! Timber Wolf Crucible Handmade Bowie / Fixed Blade Knife - Hand Forged Damascus Steel, File Worked Accents - Genuine Buffalo Horn - Scalloped, Grooved Brass - Leather Belt Sheath - Unique, Rare - 13"
Deftly balancing strength, beauty, grace and raw cutting power, Timber Wolf’s “Crucible” Bowie Knife is impressive from pommel to point. It’s a rare treat for the eyes and demands attention when showcased in a collection or solo. 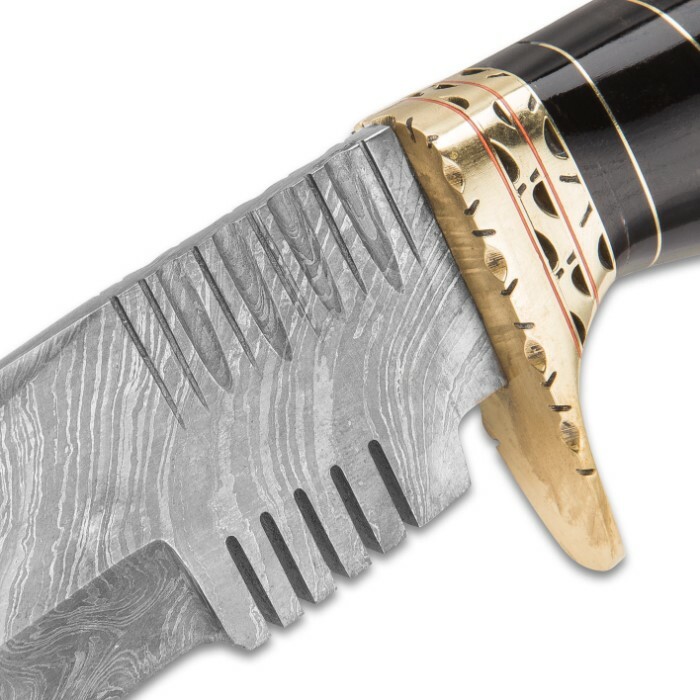 Among the visual highlights: a stunning Damascus steel blade, elegantly scalloped brass guard, shimmering brass pommel and handle accents, and delicately figured genuine buffalo horn handle. The vividly contrasting folds in the hand forged Damascus steel glint and gleam under light, while notched accents adjacent to the guard add an especially unique touch. 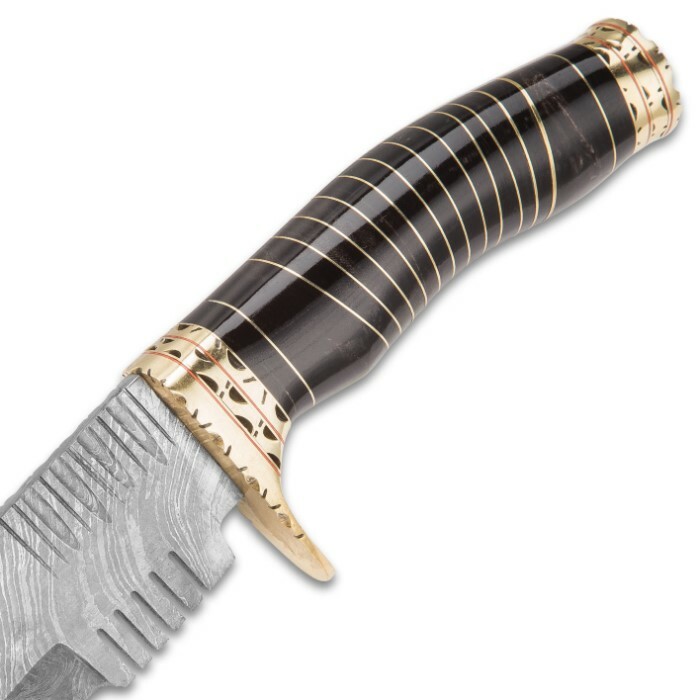 Like fine burgundy wine paired with a rare, aged cigar, the combination of Damascus steel and buffalo horn is sublime. Comprising the handle, the buffalo horn beams with rich shades of onyx and ebony, interspersed with subtle wisps of umber and cream. Gleaming brass spacers impart a chic banded look. The multitalented Crucible is more than just a pretty face, however. With its robust build, razor sharp blade edge and careful, quality craftsmanship, this beast of a bowie effortlessly slices and cleaves its way through even the toughest cutting jobs - field dressing, skinning, cutting branches and more. Its impeccable weight distribution and ergonomic handle design give the Crucible a balanced, solid feel that’s second to none - a pleasure to wield for even hours at a time. Built to last and protected by the included genuine leather sheath, with proper care the Crucible can be your go-to fixed-blade for a lifetime and beyond, making it an outstanding family heirloom. Timber Wolf’s Crucible Bowie Knife is a collector’s dream and an outdoorsman’s workhorse. Regardless of your bent, rest assured this Damascus steel wonder is up to the task. Mine came with a darker Damascus pattern as the rest of my Timberwolf Damascus collection. A beautiful knife. Looks and feels much better than what you see in the picture. Would definitely purchase again even at a higher price. Worth every penny.